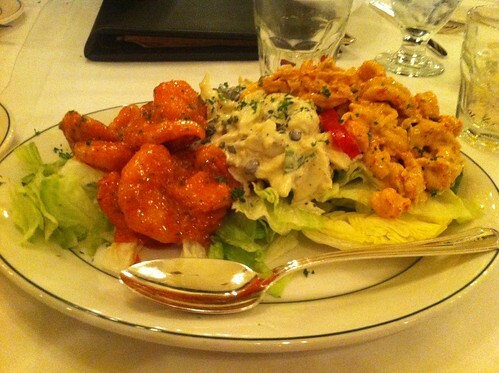 After the opening night party, nine of us headed over to Galatoire's. We had eaten at Galatoire's by ourselves last year, but this year we were tickled to be invited to join a larger group of Roadfood folks. The down side of being in such a large group: we had a long wait. We tried to seclude ourselves in the bar while we waited, but there was no space for us to be out of traffic flows. 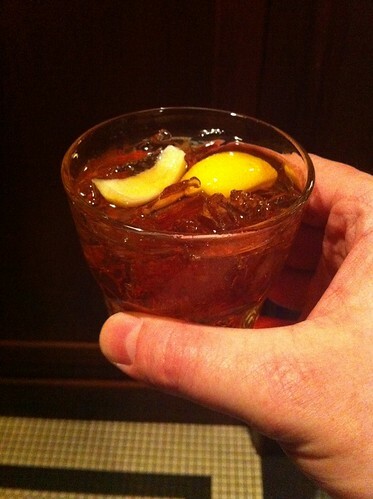 I ordered my first Sazerac, because it's the official cocktail of New Orleans. It was not to my cocktail-inexperienced taste; I mostly tasted dark murky flavors. We were several people, none of us very hungry, all expecting to sample some of everything. So we let Chris Ayers choose for us. This gave us a good selection, but it meant that I neglected to get the names of everything we ate. I've forgotten the names of some of these foods, and some of the names I never knew. I find that I've forgotten many of the flavors as well - I hope that others who were there will add their own commentary. 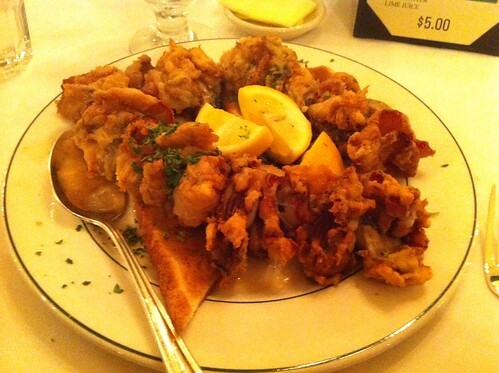 These are oysters en brochette, which is more or less a deep-fried oyster-and-bacon kebab. What I remember most about this is the rich flavor of the toast that had soaked up all the flavorful grease from the oysters and bacon. This appetizer combination was shrimp remoulade on the left (I think), and crab maison in the center - but I'm not at all sure about the right. 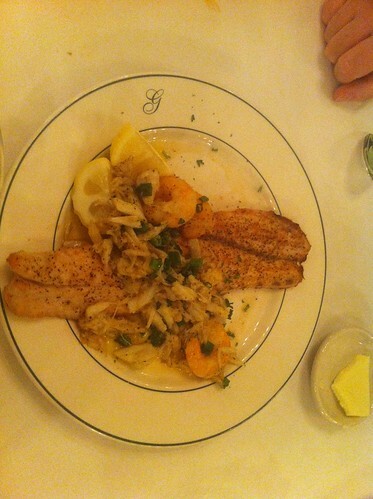 I think it might have been crawfish, but I don't see any crawfish appetizers listed on Galatoire's online menu. 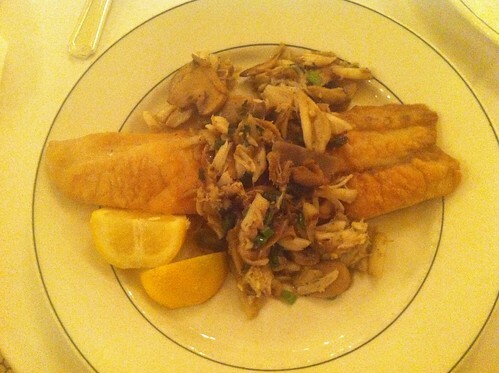 Of these, I most enjoyed the smooth tanginess of the crabmeat maison. This looks like gumbo, but a dim memory suggests it was an etouffée. 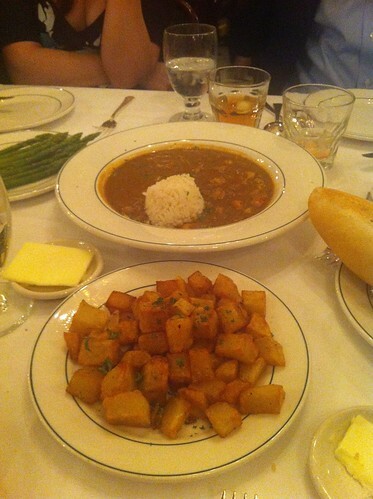 The online menu only mentions shrimp etouffée, but I think it was something else. The potatoes were Brabant potatoes, which a low-brow diner like me might describe as excellent hash browns. I enjoyed these much more than I had the year before, because I wasn't surprised by them this year. I don't remember which fish this is, but I think the sauce is the Meuniére Amandine. 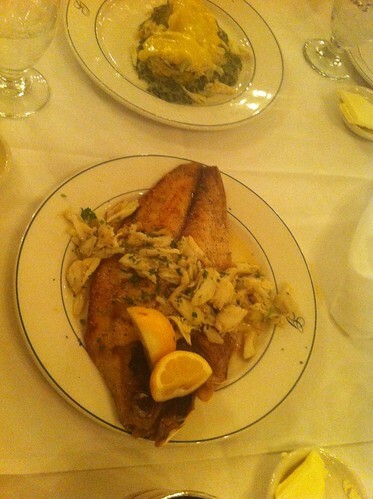 In the background, you can see the crab Sardou. Again, I don't know the fish, and this time I don't know the sauce either. I see mushrooms and (I suspect) crabmeat, but none of the sauces listed on the website obviously contain mushrooms. 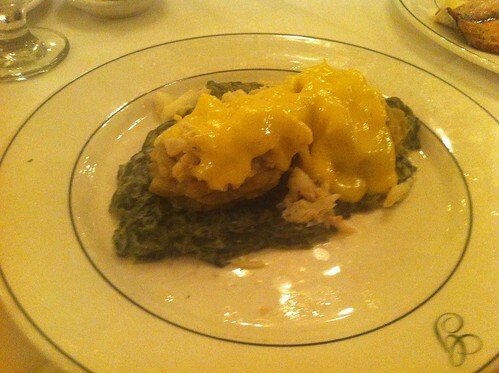 A closeup of the crab Sardou, a delicious combination of artichoke bottoms topped with crabmeat and Hollandaise sauce. 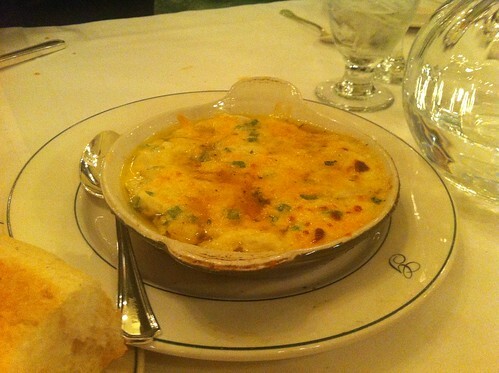 Lori is a fish frowner and a mushroom frowner, so she asked for the crab gratin to be added to the selection. This was very rich and cheesy, like a superb crab dip. Apparently I neglected to get a picture of the souffleed potatoes, sliced potatoes fried so that they puffed up like balloons. I know that Chris ordered these because he was intrigued by my description of them last year - which gratifies me, because it makes me feel like one of the explorers of Roadfood, not just a consumer of others's discoveries. As we meandered towards dessert, a host exhorted everyone in the restaurant to sing "Happy Birthday" for a gentleman at the next table. As we sang, we noticed that the birthday celebrant was wearing a tiara with the number 50 picked out in rhinestones. Chris ended up going to chat with him and getting a picture taken with the celebrant. I remember the desserts a little better, at least well enough to identify them. 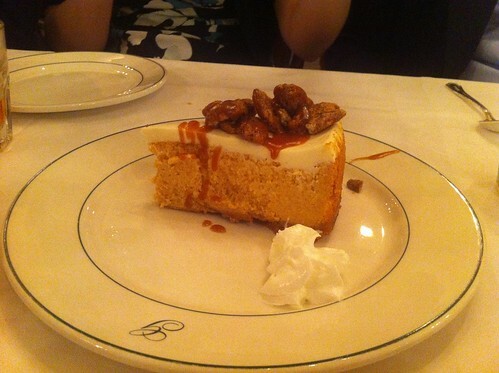 There was a sweet potato cheesecake with pecan praline topping, light and not very sweet. 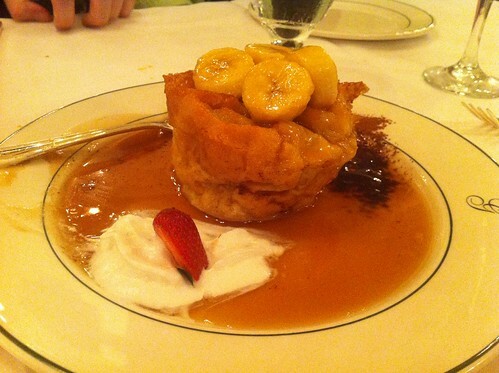 The banana bread pudding with caramel sauce was fabulous, my favorite of the desserts. The banana and caramel flavors really filled my mouth splendidly. I remember that there was also a third dessert, involving chocolate and coffee. But apparently I neglected to photograph it. 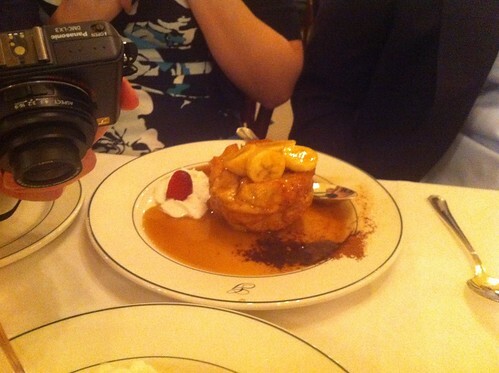 So here's another photo of the bread pudding instead. So much excellent food, and so few clear memories. I regret that I can't remember and describe every dish in vivid detail.